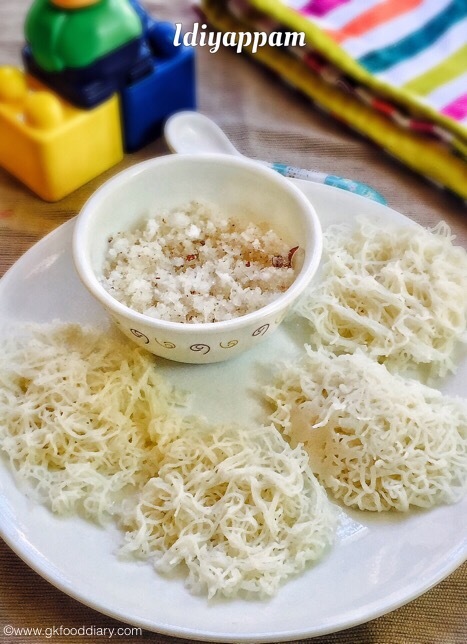 Idiyappam - Healthy ,traditional, easily digestible string hoppers aka rice noodles recipe. Can be served as a breakfast or dinner for babies. Wash the rice well in running water. Soak it in water for 2 hours. After 2 hours, transfer the rice to a blender & grind it to a smooth paste by adding water. It should be a slightly thick paste neither too thick nor watery. Heat cocount oil in a pan, add the ground rice paste and fry it in low flame. Fry it until it forms a slightly sticky soft dough. Switch off the flame once done. When it's still warm, knead the dough well with your hands. Make cylindrical shape out of the dough and place it inside the greased idiyappam press. Close the lid of the Idiyappam press and press it slowly above the steamer plate. Steam it for 5-8 minutes. I used my Idli pot for steaming. Steaming time depends on the steamer used. After steaming, carefully transfer to a plate.